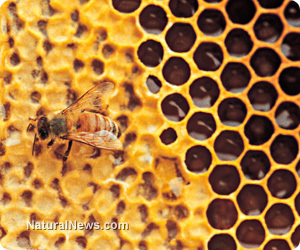 (NaturalNews) New research out of Italy has identified yet another mechanism by which neonicotinoid pesticides kill honey bees. Published in the journal Proceedings of the National Academy of Sciences, this latest study reveals that neonicotinoid pesticides like clothianidin, a systemic pesticide commonly sprayed on crop seeds, deactivate bees' immune systems, rendering them unable to naturally fight off various bacterial and viral illnesses. The end result, suggest the findings by Francesco Pennacchio and his colleagues, is bees dying off en masse, a phenomenon commonly referred to as colony collapse disorder (CCD). While there are believed to be a number of contributing factors to escalating rates of CCD around the world, many of which we have covered here in previous articles, the pesticide factor, and particularly the immunosuppression properties of neonicotinoid pesticides, have once again been confirmed. For their study, Pennacchio et al. took a closer look at how neonicotinoids impair proper immune function in bees. While this class of pesticides has previously been reported to enhance the impact of certain pathogens, making them more deadly, little is know about how this process works on the molecular scale. So to gain a better understanding, the team conducted a series of tests with a pathogen known as "deformed wing virus" to identify how these chemicals actually impact bees' immune systems. What they found was that clothianidin negatively alters the expression of a key molecule involved in the natural immune response of bees, which in turn makes pathogenic diseases more virulent. Known as NF-?B, this molecule was discovered to be susceptible to suppression by a class of proteins known as leucine-rich repeat (LRR) proteins, which naturally occur in insects. But clothianidin was found to greatly increase production of LRR, which in turn suppresses NF-?B even more than normal. "We have identified in insects a negative modulator of NF-?B activation, which is a leucine-rich repeat protein," explain the authors in their abstract. "Exposure to clothianidin, by enhancing the transcription of the gene encoding this inhibitor, reduces immune defenses and promotes the replication of the deformed wing virus in honey bees bearing covert infections." Similar immune damage was observed in honey bees exposed to imidacloprid, another neonicotinoid pesticide under heavy scrutiny these days. Just like with clothianidin, bees exposed to imidacloprid at levels commonly found in conventional crop fields suffered similar immune damage, leaving them susceptible to serious infection and death. "The reported effect on immunity exerted by neonicotinoids will allow additional toxicological tests to be defined to assess if chronic exposure of bees to sub-lethal doses of agrochemicals can adversely affect their immune system and health conditions," stated Francesco Nazzi from the University of Udine, who also contributed to the study. "Moreover, our data indicate the possible occurrence in insects, as in vertebrates, of a neural modulation of the immune response." Though the study focused specifically on neonicotinoid pesticides and their effects on honey bees, its findings have implications for many other pesticides and their effects not only on insects but also on humans. Monsanto's Roundup herbicide comes to mind, as a growing number of studies has identified this persistent crop chemical as damaging to the immune systems of humans. Specifically as it affects the gut, Roundup, also known as glyphosate, has been shown to damage the delicate microflora balance that sustains the immune system. Persistent exposure to even very low levels of Roundup has proven to inhibit the function of this microflora, which not only blocks the proper absorption of nutrients but also renders the entire microbial ecosystem deficient in sustaining immunity.